I’ve finally made a start on the open cluster observing programme I talked about in… February this year! It seemed sensible to start with an easy one because I was determined not just to observe and classify, but to produce a sketch too. 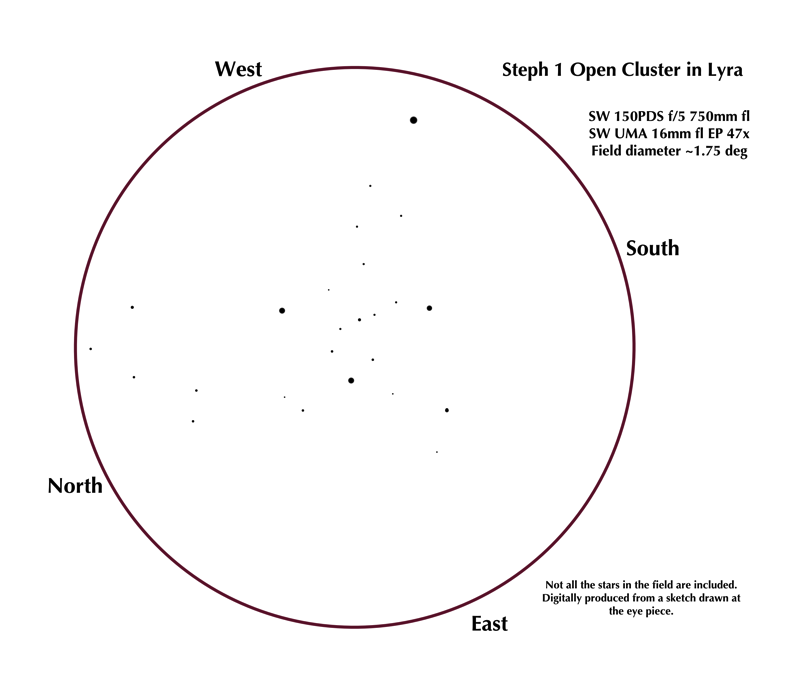 The chosen target was Stephenson 1, which is also known as the Delta Lyra Cluster. 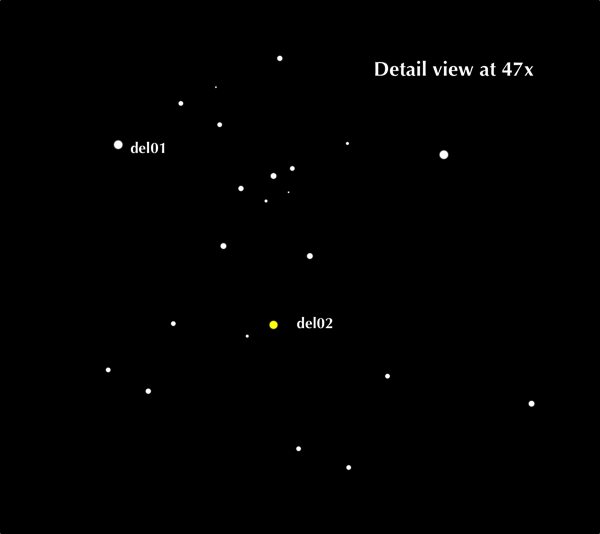 As you’ve probably guessed, the delta Lyrae visual double – and many would say that is enough reason to take a look – plays a key role in the structure of this open cluster. The delta02 Lyrae component lies right at its heart, and makes finding this cluster pretty straight forward with nothing more than a red dot finder. The instrument I chose was my Skywatcher 150PDS (a recent addition) furnished with a 16mm Skywatcher Nirvana eye piece (also a new addition). This combination provided a field of view of about 1.75 degrees, or 105 arcminutes, at an angular magnification of 47x. And so, for your enjoyment, here’s the sketch drawn at the eye piece and later scanned from my logbook. Ok, there are two sketches really, one with the field stop, and another drawn larger with more detail. It might be a little messy, but I think it’s a good representation of the cluster. I’ve also tried using digital means to clean it up a bit. The image below was produced by tracing the original scan using a paintbrush tool to make round stars. I wouldn’t need to do this if I’d been more careful. A lesson for next time. Using the field stop as a guide, I’d estimate that the cluster spans about a third of the field which gives it an angular width of about 35 arcminutes. Now to the matter of classification. I’m supposed to classify each of the open clusters I observe using the Trumpler system (which is explained in this nice article. It’s clearly not rich with stars, I could count no more than 20 actually in the cluster. I suspect larger apertures would find more. So the rating for the number of stars in the cluster would have to be p (poor). By virtue of fourth magnitude del02 Lyrae and many stars I’d estimate at magnitude 8 to 12, it’s got both bright and faint stars alright. This yields a range of brightness rating of 3. Finally there’s the question of concentration, and I have to admit to struggling with this one. I’m not clear on what constitutes a cluster being deattached, or not. Stephenson 1 certainly lacks any central concentration. This leaves me with a rating of III or IV, but which one? I guess I’d have to say that it’s more of an increase in the density of stars than a clear concentration, so perhaps IV, but it could have gone either way for my money. I guess I’ll get better at this with practice. 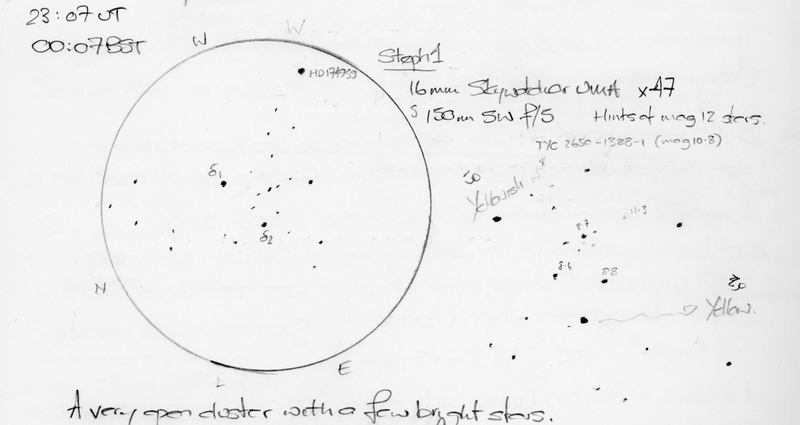 Piecing together my work, I’d classify Stephenson 1 as a IV3p open cluster of about 35 arcminutes angular diameter. According to the professional data del02 Lyrae isn’t likely to be part of the cluster as it’s nearly 100 parsecs closer to us. It’s still a pretty yellow coloured star though. I really enjoyed doing this, and I’m looking forward to the next one. But which will it be?